It is not even 10:30… but my lunch is calling to me. Leftovers aren’t usually this enticing. 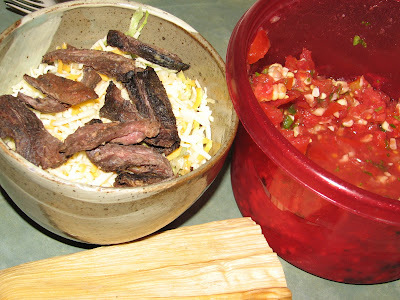 Season beef over shredded lettuce and cheese… with salsa that makes me smile. And a tamale. All leftover from Cuatro de Mayo. I know… but you have to make time to celebrate Mexican food when you can. It was a delicious evening. Salty chips, 7-1 layer dip, fruity drinks, and friends. Because it isn’t all about the food. Anyone can make good food… but it takes great friends and lively conversation to make it a true fiesta. And while there is an abundance of food tucked into the fridge, there are just as many happy moments tucked away in my mind. Happy Cinco de Mayo! So glad you got to celebrate last night. May your leftover food and your stored-away memories continue to make this a special day for you! It was so much fun! I am so glad we all were able to attend and I do hope we get a re-invite. Crotcho de Mayo. Or Cuatro...whatever...it is the people that matter not the title. Right? You both outdid yourselves on the food...YUMMO! Sounds like a YUMMY lunch to me! I was so sleepy...before I saw your post. Now I'm hungry! That food looks delicious and I can almost taste it. Glad you enjoyed Cinco de Mayo! !